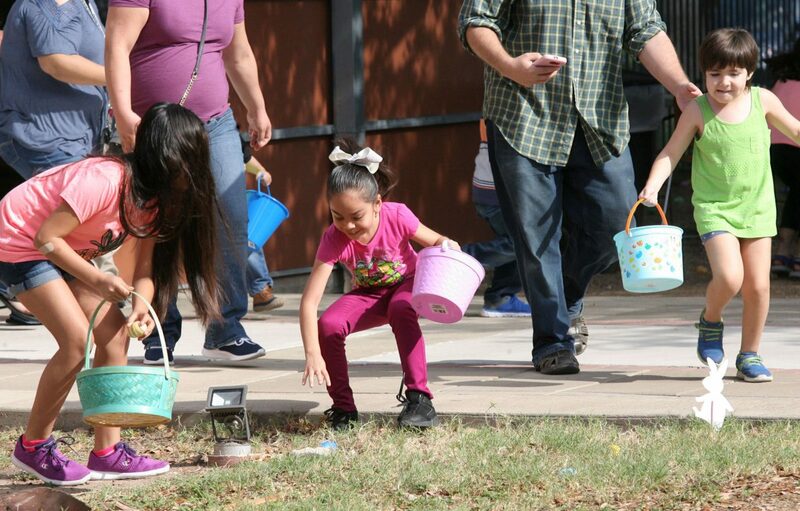 Over 60 children skaddle to find the colorful Easter eggs during the IMAS Easter Egg Hut Saturday March 31, 2018, in McAllen. 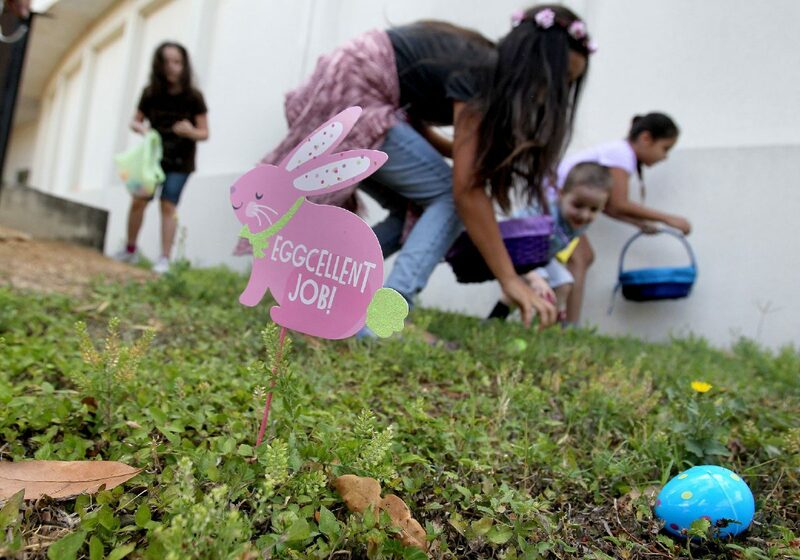 McALLEN — Siblings Kaitlyn, 9, and William Foster, 10, sprawled their collected Easter eggs on a picnic table at the International Museum of Art and Science, picking each one up to give it a rattle and guess the content inside. The pair sprang from bed early Saturday morning to make the trip from Brownsville and line up outside the museum in anticipation of the Bunny Bash. Hundreds of children and families attended, arriving with an empty basket and leaving with a bounty of eggs — not to mention an unforgettable memory. Volunteers and staff planted approximately 2,000 eggs around the museum grounds, each with a treat nestled inside. 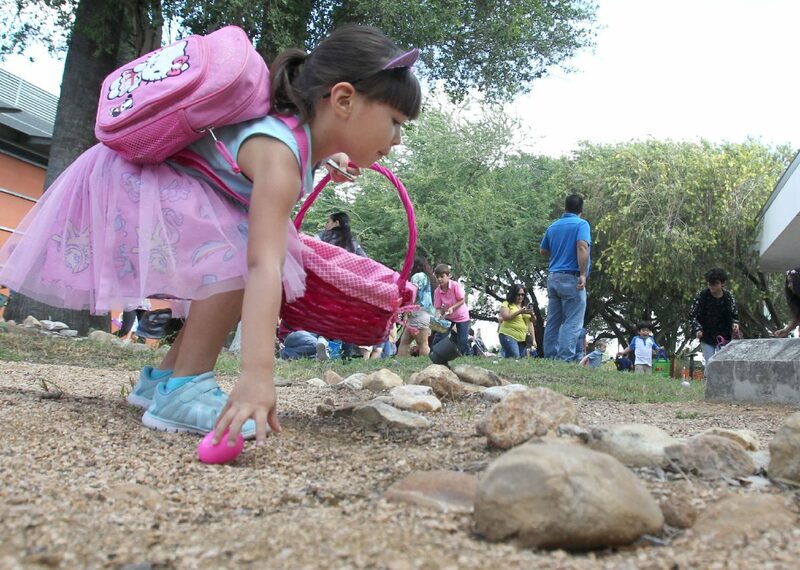 Over 60 children and their parents gather colorful eggs at the IMAS Easter Egg Hunt Saturday March 31, 2018, in McAllen. 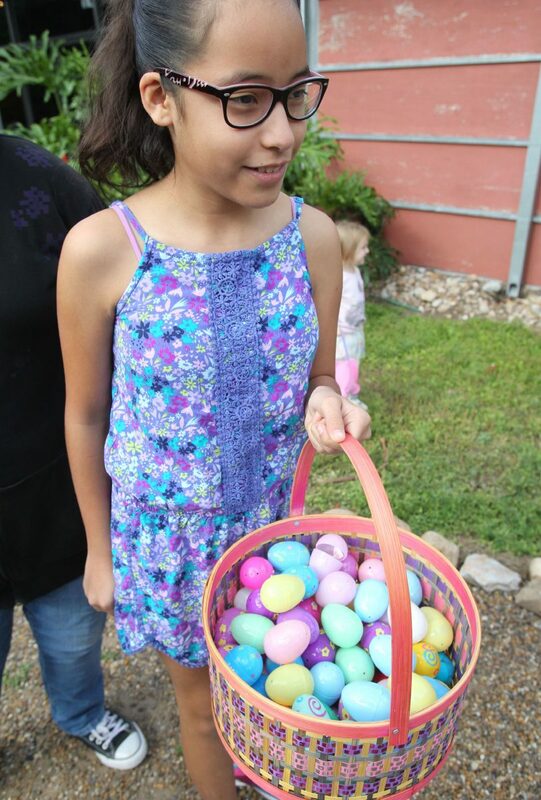 Kaylee Garcia,11, of Mission show off her basket filled with colorful Easter eggs at the IMAS Easter Egg Hunt Saturday March 31, 2018, in McAllen. Children and their parents wait inside the museum before the start of the IMAS Easter Egg Hunt Saturday March 31, 2018, in McAllen. Candy, temporary tattoos and festive miniature erasers were some of the treasures discovered. One “grand prize” egg offered a year’s membership. After participants were signed in and registered, the IMAS staff announced safety guidelines to maintain a “friendly” atmosphere, for which parents expressed appreciation. Volunteer Coordinator Claudia Martinez said the museum staff was thrilled with the high volume of interest in the event expressed from parents of preschoolers to young tweens. Those involved began setting up for the festivities the evening prior. Other activities in the bash that went on from 10 a.m. to 5 p.m. included jellybean science, bunny art, story time sessions and a cascarones workshop. “Hopefully this gets people who have never been here a chance to experience the museum for the first time. … And maybe learn a little about STEM,” Martinez said. Inside the Ann Moore art studio, watercolor paints were placed on tables and Easter coloring sheets were handed out for kids to create their works of art. While their children zoomed about the sculpture gardens and courtyard to collect eggs from hidden crevices — made easier by the bright, spring colors — parents lent helping hands by trailing behind to cart the basket. Kyra, Kendra and Isaiah Douglas of Mission said this was the best Easter egg hunt they have ever attended and are hoping the museum will continue hosting it in the years to come.